The gate to the cleared but not-quite vacant site of the former Albany Paper Mill on Jan. 31. The sprawling Millersburg site where International Paper shut down and demolished the Albany Paper Mill still sits mostly empty, presumably awaiting a buyer. 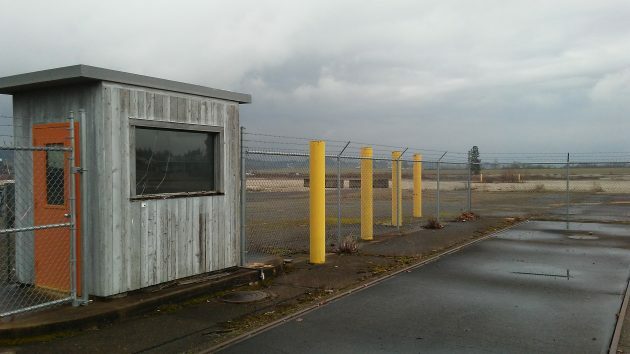 But some local officials have visions of turning the place into an intermodal shipping hub that would bypass the troubled Port of Portland and link the valley to the world. This sounds like fantasy now, but if it helps agriculture and other valley industries, it’s worth pursuing. Somebody in Millersburg told me he thought Rep. Andy Olson, R-Albany, knew something about this. So I asked. Olson was part of a legislative commission on transportation last year. In Ontario the panel learned of a project to create, for an estimated $22 million, an intermodel hub there that would “bring product to rail.” It occurred to Olson that this could prove useful on the west side of the Cascades as well. The legislative commission toured the IP site when it met in Albany in October. Olson said he and Linn County Commissioner Roger Nyquist shared the hub idea with the panel. The legislature, now in session in Salem, is supposed to come up with a transportation package, and Olson thinks the Millersburg hub idea could become an item in that. Why a truck-to-rail shipping center there? “The hub is a stepping stone around the Port of Portland,” Olson says. “The port continues to be a problem for business.” And so, for shippers in western Oregon, the intermodal hub would create a path around Portland to the much bigger ports in Tacoma, Oakland or Long Beach. Maybe they could even reuse the old truck scales. Hasso, when you were in the newspaper business you generally stuck to journalistic principles, one of which is to avoid the sophomoric trick of taking a quote and putting it in some context that supports your position or belief. I realize that a personal blog is not News in the strictest sense, but in a small market such as Albany, an Old Editor still carries weight. Of course Olson will say these things. His strong anti-union positions are well exposed as he’s been occupying a seat in Salem for a long time. The Port of Portland has seen a certain amount of labor strife over the decades, but Olson’s assessment sounds like PR fodder for the Right. A little red meat, but in the grand scheme, mostly gristle. A hub of this nature might or might not help Albany get into the shorts of ports like Long Beach, Tacoma and others. Plus, replacing a belching paper mill with a raft of fume-spewing diesel trucks and trains might be good for the city. Hard to know for certain. This reader just wishes that the creators of this blog would not lift a one-line, out of context quote from a local pol to lend credibility. This is sheer hucksterism on Olson’s part. Besides, the proposed hub would likely be utilized by union rail workers and union truck drivers. 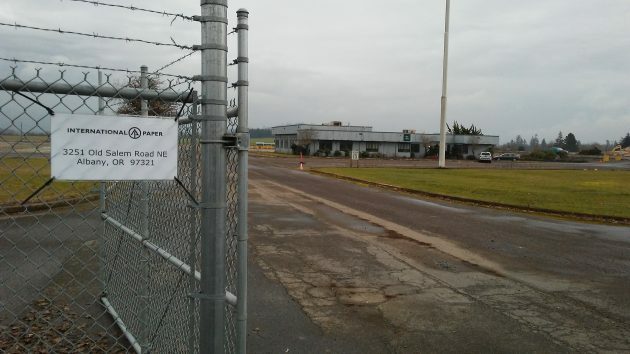 If the Port of Portland is “a problem,” the Albany Intermodal Transport Hub could be the same. You’re over-thinking it John… Andy is quoted much more than the single “one line” (and out of context) excerpt you pull. What is factually incorrect about what he says? As a relative newcomer to this area, I’m not up to speed on the begats of local politics. I read this as an article bringing forward (with source attribution) about a possibility to help the common good. Hartman must know something that’s not in the article. I don’t see the basis for his position in that piece. First and foremost, when Hasso asked Representative Olson the “why build it here” question, that was the most important question for many reasons, potentially lots of money being one of them. Secondly, I have no objection to the hub concept. It would bring some good paying jobs. I do, however, object to Representative Olson’s unsupported line of innuendo regarding the “problems” at the Port. That’s all just anti-Union code. One wishes Olson had the courage to say it aloud. Looking at Olson’s claim that Portland Ports are a “problem for business” is code for business doesn’t like unions. Unions make labor less productive, or so goes the pitch from business. Now consider the Greater Portland Inc. business development unit, comprised of more than 80 private and public sector partners, chaired by Jim Piro, CEO and President, Portland General Electric. Greater Portland Inc. thinks otherwise from Representative Olson. By the way, the other members on Greater Portland Inc’s board reads like a who’s-who of the 5 County Metro area. Their understanding, unlike Olson’s comes from actually living there and working there, unlike Olson. Compare and contrast the alternative facts Olson proffers. Then read what the people who are live and work there have to say… a little data from the industry captains in Portland. If Representative Olson’s breezy dismissal of the Port of Portland is some sort of play designed to attract attention to the proposal Hasso outlined, it seems rather transparent. Or maybe Representative Olson thought tossing some red meat to his audience would be a good thing. Who knows. Lately, all the facts alternate. Hartman has a personal problem with Olson. Thank you for the common sense follow up. Not sure if Hartman just doesn’t have all the facts or is just blinded by his distaste for Olson. Either way, I know the seed shippers have been suffering as of late with the shipping line pulling out. Happy to hear someone is trying to do something and create local jobs at the same time. I’m just surprised Hartman didn’t blame Trump for something? Might make sense to wait and see if Trump delivers on his isolationist rhetoric. No point in building a shipping terminal if the export markets get crushed. Sorry for having thrown water on the Andy Olson Love Fest. When members of the Farm Bureau are complaining, you can be sure someone is doing their job correctly. These heavily subsidized people claim they are the backbone of America…as long as the crop subsidies continue. Anything that gets in the way of this AG Machine, including Union Port Employees, are getting in the way of Farm Bureau member profits. It may just be that Representative Olson takes campaign contributions, but of course, he would never be unduly influenced. I’ll look it up. I’m a farmer – as are my parents – and proud Farm Bureau member – no subsidy here. Three words for Mr. Hartman: lighten up Francis. If you don’t get it, watch the movie “Stripes”. Very applicable here. In our current political environment, there are a lot of people that should follow the same advice. Hopefully something becomes of this possibility. As far as the Hartman chronicles go, if I see his name, I just skip to the next entry.